Now, make no mistake, Judges is in scripture as a negative example: do not act like this. It has become common then, to read this repeating formula as if it were saying that the bad morality displayed in this period is because there wasn’t a king — that is, if they’d had a king, they’d have been better. There is a glaring problem with this: it’s clear from the book of 1 Samuel, which follows Judges, that having a king is itself part of the bad thinking, and not what God or Samuel want. Mary Evans, in her new commentary on Judges, suggests a nuanced interpretation, one which doesn’t occur to us because we’re not living in the kind of monarchy that the biblical writers would have been writing in. If we lived under a dictatorial monarchy that we knew God didn’t really want, when things went badly, we would be tempted to blame everything bad on the monarch. Into such a situation, Judges could be telling you about the old days, which were not good old days, and using our repeating phrase to say: yeah, but things were awful even before the kings; the problem is not the form of government, it’s deeper and wider than that. The problem is the unfaithfulness of the people. Bart looked at us and said, “I don’t know about you. But that makes me feel a whole lot better about my doubts and fears.” They saw him, they worshiped him, and still there could be doubts. Put yourself in the place of the disciples. That’s hard. But imagine yourself as one of the guys who walked around with this miracle worker. You believed in him when your family and friends were telling you to get real. In the real world, they insisted, his little miracles and big ideas didn’t count for much. The Sanhedrin were still calling the shots in the Israel, not him, and in the wider world, Rome’s military might and administrative control was unstoppable. But you believed Jesus, even when the Sanhedrin flexed its muscles and arrested him and then had him appear up there on stage with the Roman governor. Your blood boiled to see him act submissive — this man who could raise the dead and still the storms. Perhaps you felt a twinge of doubt at that point — clearly the crowds who didn’t know hom as well did. They turned on him, understandably. They had briefly shared your high hopes that he would confront and defeat the oppressive government as he confronted the moneychangers and dovesellers in the Temple. Instead, when push came to shove, confronted by the real powers, he was silent as a sheep before the slaughter. But now, it’s the beginning of Acts. He rose from the dead and it shows — he’s different. Power leaks from him even more than before. You’re imagining the looks on the faces of High Priest and of Pilate when he enters Jersalem again to confront them to reply with their politics of violence with his peaceful, unstoppable Presence. It won’t be just the moneychangers he’ll be after this time. They’ll have to bow down, won’t they? The Sanhedrin, the Roman governor, even the Caesar. This time, it’s clobbering time. His first coming to Jerusalem was only the prelude. This will be his Second Coming! He’s back! Remember that, when it was time, your God told his general Gideon “You have too many men,” and to whittle the forces down to a few (Judges 7:2); remember that, when it was time, your God told the armies not to beat against the city walls with hammers until they fell, but only to march round it, making noise (Joshua 6:2-5). Here we are, few in number and not impressive in fighting prowess, but there he is, resurrecrted from the dead, and he promising that we will soon be drenched in God’s Spirit, as John — who predicting coming judgement — had promised. If he says it’s time, then it’s time. We don’t need a huge, trained army. Wouldn’t you ask, as they did, “Lord, is this the time when earthly governments fold and you become all in all?” Wouldn’t you? And when he gently, cryptically replies and it becomes clear that the answer is “not now” and then — this man who death could not take away from you, this man who has the power now to set everything right — chooses to leave you. He just disappears into the sky. How do you feel? 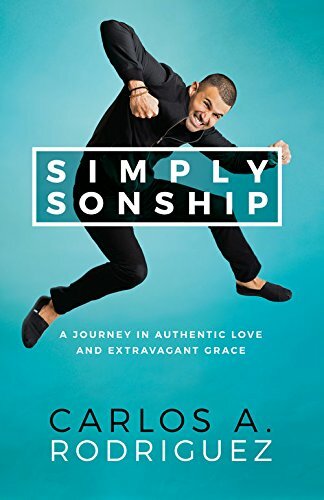 I enjoyed meeting and sharing the stage with Carlos Rodriquez at #SimplyJesus 2017 — he’s full of energy and his talks presented such an infectiously positive take on our relationship with Jesus. In particular, the first of his talks was about the sending out of the 70 (or 72; Luke 10:1-24). The ultra-simple point that nevertheless really struck home was this: we often talk about how we need to believe/have faith in Jesus, but a story like this shows how much Jesus believes/has faith in us! The room was filled with tired Jesus followers and it was good to be so enthusiastically reminded how much Jesus likes us.